Crisscross and divide up residential areas with ugly structures of concrete and steel? Funnel all automobile traffic from north, east and south into the narrow peninsula that comprise Downtown Vancouver? Create unprecedented and impossible traffic congestion and traffic jams? Pollute our air to the danger point until it becomes as bad here as in Los Angeles? Bring people instead of cars into Vancouver’s downtown area and to place of employment? Move people quickly and efficiently at low fares, saving time and money for transit users? Keep down debt and taxes? Provide frequent and efficient service between municipalities and within each municipality so that everyone will have far greater freedom and ease of movement? We can have one or the other. Which one we get- freeway or rapid transit—is not only important for the reasons given above. The undeniable fact is that the kind of transportation system we end up with will decisively shape the nature of the growth and development of our cities and municipalities for decades to come. Our future is very much at stake in the choice and decisions that will be made. You can help decide what that choice will be. The number of morning rush hour commuter trips into downtown will increase accordingly. Many of these rush hour commuters will need public transit, for those roads into downtown will have limited capacity. We will have to make a choice very soon because powerful interests are at work endeavoring to impose a freeway system on the Greater Vancouver area. The city of Vancouver is the local point. Here freeway plans are already well advanced-more so can most people realize. Vancouver City Council is trying to sneak in a freeway system piecemeal, one section at a time. This way the total effect will not be felt at once. People will not know what is happening. The freeways sections are being planned and build in such a ways that each completed section logically demands another. This is of concern not only to Vancouver. While Vancouver cannot build freeways its own boundaries, yet once these freeways are built in Vancouver you can be sure they will not abruptly end at city boundaries. They will be extended into adjacent municipalities. Then we’ll all be saddled with freeways whether we like or not. A north-south freeway in the Ontario and Quebec street corridor, also linked up with the Georgia viaduct. A third crossing of Burrard inlet (called Brockton crossing and located just east of Stanley park). A waterfront highway from the Brockton crossing to the north-south freeway, and going through the CPR’s Project 200. A Taylor expressway going along the North shore of False creek where the CPR is planning another West End-type of apartment jungle. The Vancouver Transportation Study has never been officially adopted by the Council. Yet a majority of Council is trying to implement the report piece by piece. The citizens of Vancouver met this report with open hostility. The Chinese community vigorously protested the connection between the north-south freeway and the Waterfront Highway which would go along Carrall Street and cutup Chinatown. Council had to drop this plan and consider a connection along Gore street. The resident of the East End rose up in arms against the east-west freeway which would go through the heart of their area, cut their district in half and compel the expropriation (and removal of destruction) of about 1,200 homes. So Council had to drop this scheme too. But Council didn’t give up by any means. It went ahead with plans to replace the Georgia Viaduct, shelving some of the other sections for the time being. But what it built was much more than just a replacement. What we have now is a two pronged viaduct designed as the hub of a downtown freeway system. The Vancouver Transportation Study admitted (page 25) that “the Georgia viaduct replacement is in effect a western extension of the east-west freeway”. There is now sits awaiting decisions about connector links at each end. Compelled by to drop its Union-Prior corridor route for an East-west freeway, Council’s next step was to set up a Liaison Group included aldermen Wilson, Broome, Rankin, city officials, a team of consultants responsible for selecting a route, and representatives of five community organizations from the East End. The study team of consultants has selected a new route that would go in a south-easterly direction form the East End of Georgia Vaiduct, avoiding the densely populated areas, and linking up with Highway 401 in the vicinity of boundary Road and the Grandview Highway. A conservative estimate places the number of homes that would have to be demolished at between 90 and 105. However, this does not take into consideration the construction of ramps that would bring this figure closer to 200. It is significant that the connector link they have selected makes no provision whatsoever for rapid transit. The community representatives on this Liaison Group have given their views on the new alternative route. They have turned it down flatly. “While the $60 million freeway route now being proposed by the consultants is less reprehensible thean the Union-Prior corridor earlier considered” they said in a statement to Council signed also by Alderman Rankin “it is still a freeway, and freeways our citizens don’t need and don’t want.” They then proposed that council drop all its plans and get busy on a rapid transit system. Council’s unofficial plan is now to connect the west-end of Georgia Viaduct via Georgia and Dunsmuir streets with a new freeway crossing of Burrard Inlet, Council has opted for a tunnel rather than a abridge. Ottawa has offered to pay the cost of the tunnel, but only on condition that its contribution will be recovered in tolls. The provincial government has pledged $27 million for tunnel approaches. But a third crossing, whether a bridge or a tunnel, is not the urgent need its promoters represent it to be. All survey show that the bulk of the traffic entering Vancouver comes from the east and south, not from the North Shore. In fact traffic the traffic volume to and from the south and eats is approximately the volume of traffic to and from the North Shore. But because Liberal politicians promised another crossing to North and West Vancouver business interests, and because of pressure from freeways promoters, plans for the crossing are being pushed ahead. Other planned sections of the freeway system scheduled to come before Council sooner or later are links which will connect Burrard and Granville bridge with Georgia viaduct and with the third crossing, the north-south freeway, along the Quebec Ontario street corridor, a Waterfront Highway, and the Taylor Expressway. Then our half a billion dollar eyesore and traffic congester would be complete—fro a few years, that is, when inevitably there would be a demand for still more freeways. Once caught up in the freeway cycle, there’s no escape. That’s the plan that is being implemented piecemeal. It is still in its initial stages, but every completed section makes other sections more certain. If we are going to stop it at all, the timer is now before it has a chance to go much further. The adverse effects of freeways are obvious and numerous. If you want to see Vancouver would be like in five or ten years from now if it gives through with its freeways plans, just look at Seattle and Los Angeles. Freeways are an eyesore which will artificially divide up cities and municipalities. It is fundamentally wrong to siphon all traffic into the narrow neck of land (bottleneck would be a better word) which constitutes Vancouver’s Downtown area. More and more of our choice land in Vancouver’s Downtown would have to be taken over a great expense and used for parking lot, and many city streets widened to serve the freeway system. Freeways will further aggravate the lopsided growth of Vancouver where far too much development is going into the Downtown area. Since the freeway system would be spread over the whole Lower mainland, all its citizens would be saddled with enormous debts and increases in property taxes. The experience of all cities which have freeway systems clearly proves that freeways solve nothing. They contribute to the very problem which they are supposed to solve—Traffic congestion. And the accident and death toll from the hundreds of thousands of cars on our freeways systems will continue to mount, as will the already too high insurance rates. Why then, are freeways being promoted by Vancouver city council? The answer is that powerful special interests want them. They are the business interest who stand to profit directly from them. First among them are the big real estate interest and devlopers. The CPR has project 200 – the complex of hotels, apartment and offices – which includes 5,000 parking stalls to be linked to the freeway. The CPR is also building a huge apartment complex on the north shore of false creek; Taylor expressway was designed to service this area. The Bronfman interests, Eatons, and the Toronto Dominion Bank want traffic directed to Block 42-52. Near Stanly Park the Four Seasons and Bayshore Inn interest want the freeway to serve them. Then there are the car manufacturers and the oil interests who push for freeways everywhere and the big construction firms looking for lucrative multi-million dollar contracts. These are the private interests that want the government and the public to spend half a billion dollars on freeways just to serve them! No matter where you live in the Lower Mainland – these selfish interests are determined that you must foot the bill for freeway to enhance theirs profits. No wonder the citizens of the Lower Mainland in increasing numbers are saying NO! We’re not going to subsidize the freeways with our hard-earned dollars and pensions! The majority of our citizens are already opposed to freeways and their number is growing constantly. They include a wide variety of community organizations, ratepayer and tenant groups, trade unions, anti pollution groups, and increasing number of city planners and aldermen—in fact, citizens from almost every walk of life. For the most part the groups and individuals opposing freeways are also supporting rapid transit. They look upon it as the only realistic alternative. It’s a view I wholeheartedly share. We can’t ignore the fact that the number of motor vehicles is growing twice as fast as the population in the Vancouver region. If we don’t take control of the situation now, the demands of the car will soon control us completely! Some politicians and municipal officials, feeling the pressure of the opposition to freeways and the support for rapid transit, have come out with a “compromise”. They say we we don’t need to choose freeways or rapid transit, and that we can have both. This argument they clothe in the fine and sounding phrase, “a balanced transportation system”. I want to say without equivocation or hesitation that this is a lot of nonsense. It doesn’t come from people who don’t know better. It come from people deliberately trying to mislead and deceive the public. It is coming from people who are busy promoting freeways while doing nothing about rapid transit. The reason we can’t and won’t have both freeways and rapid transit in the Lower Mainland isn’t only because we can’t afford both. The cost would be staggering. Even more important is the fact that freeways and rapid transit serve opposing purposes and interests that can’t be reconciled. Isn’t the fact that Vancouver city council is building freeways while just paying lip mservice (and hardly even that) to rapid transit proof enough that it has made a choice? It isn’t building any “balanced transportation system” — it is building freeways! Perhaps at this point it would be worthwhile to go into the whole question of rapid transit more deeply. What do we mean by rapid transit? As the term is usually used, it means any form of public transportation operated over its own exclusive track or roadway and separated from other traffic. Examples of rapid transit are the subways of Toronto, Montreal, London, Paris and Moscow; the elevated trains of Berlin and New York; the one-mile monorail in Seattle; and an exclusive bus roadway in Washington D.C. Rapid transit systems are often supplemented by others from of rapid transportation including commuter trains, express buses, ferries and hovercraft. In the Lower Mainland we could use all of the above or any combination of them, to suit our special needs. What we’re after is a good travel system that will get people where they want to go, when they want to go and at low cost. Rapid transit us designed primarily to move people, rather tha cars, swiftly, efficiently and economically, to and from work, to and from the Downtown area of Vancouver, from one point to another within a city or municipality, and from one city or municipality to another. Let me add that advocating rapid transit does not imply that we don’t need or shouldn’t use cars any more or that traffic roads don’t need improvement. All that rapid transit is trying to do is to eliminate unnecessary car trips. People will continue to use cars for shopping, visiting family trips and the like, and adequate roads and parking facilities must be available. But wherever it is not essential to go by car, rapid transit should offer a cheaper, faster and more comfortable service. In fact it must be made so advantageous that people will use it whenever they can. It proposed a rapid transit network consisting of four main corridors to be completed by 1990. North Shore—Granville and pender across new Burrard crossing to Upper Levels Highway. At peak periods, trains would run every two or three minutes and at six minute intervals during off-peak periods. The study states that the Kingsway Corridor has enough traffic today to warrant its construction immediately, and estimates that it would take 7-10 years to get in operation. The Kingsway Corridor would “leave the downtown area by means of an elevated structure parallel to the new Georgia Viaduct and turn south near Main to cross over the CNR yards. It would be underground below Prince Edward, Kingsway and 22nd Avenue to Nanaimo. At this point the line would occupy the BC Hydro right of way between Nanaimo and Willingdon, using open cut construction…Stations on this line could be located near Main, Broadway, Knight, Nanaimo, Renfrew, Central park and Willingdon”. It proposes that the rapid transit network be complemented by feeder bus routes and parking lots fro those who wish to park their cars for the day (“park and ride”) and for those who pick up or drop off passengers (“kiss and ride). The study also points out that in Montreal and Toronto, 70% of the peak of travel oriented to the central business district is by public transit. This shows the potential for our area. How do we Get Rapid Transit? Who should be responsible for establishing a rapid transit system in the Lower Mainland? What Practical steps should be taken immediately to implement rapid transit? Who will pay for rapid transit? What political action needs to be taken? It will be obvious to all that rapid transit cannot be brought about by each municipality if it is left to do or not do its own thing. It is essentially a regional matter and must be tackled on a regional basis. We already have a regional structure in the Greater Vancouver Regional district. Its directing board consists of members appointed by the various municipalities included in the district—15 cities and municipalities plus 3 unorganized districts. The GVRD should set up a transit Authority for the whole region with the responsibility and authority, under the direction of the GVRD, to establish a transit system for the region. Under no circumstances should the Transit authority become an independent or autonomous body. (we already have one sorry example of this in the PNE in Vancouver. Although all its facilities are publicly owned, its operation has been turned over to a small group of businessmen who use our publicly owned facilities for the benefit of private professional sports promoters who get use of our facilities for next to nothing). The Transit Authority must be appointed by and be directly responsible to the GVRD for all its action. Only in this way can public control be maintained. Don’t forget that if and when we get a rapid transit system, the special interests who oppose rapid transit and support freeways would be only too happy to see rapid transit run in trouble. The first point that should be made is that rapid transit services (and an upgraded bus service, too) should not have to pay their own way through fares. Rapid transit should be regarded as a service, as essential to a community as sewers and water, and the costs should come out of general and special revenues. The bulk of the cost to build and subsidize a rapid transit system should not be placed on the property owners and tenants of the municipalities. These costs should be met by grants from senior governments. The fact is that the difficuylt financial situation our cities and muncipalities find themselves in is not of their own making. It is the direct result of a distribution of taxing authority under a British North America Act adopted over a century ago and now completely out of date, and the contributing failure of senior governments to adjust their contributions to municipalities to the changed needs of the times. Urban center are growing at an accelerated rate. Today only 7% of our entire population is engaged in farming. It is estimated that by the end of this century, 90% of the population will live in large urban centres. The economic council of Canada predicts that by 1980 one third of all Canadians will be concentrated in three large metropolitan areas- Montreal, Toronto and Vancouver. Several of our cities already have larger population than several of our provinces. Hand in hand with this urban growth has come the demand for all manner of essential services – police and fire protection, street, sidewalks, welfare costs, education, parks. These costs have grown enormously. Yet our municipalities must rely mainly on property taxes to raise the necessary funds. All the other significant means of raising revenue (income and corporations taxes, resources tax, liquor tax, gasoline tax) have been reserved by senior governments. Municipalities must go hat in hand to senior government for grants to meet their rising expenses. This situation needs correction and it can only be done by senior governments. Obviously some constitutional changes are needed. In this case of rapid transit though, no constitutional change is required –only the agreement of Victoria and Ottawa that they will pay the bulk of construction and operating costs. The provincial government has already committed itself to pay some of the cost. On October 27, 1970, Provincial municipal affairs minister Dan Campbell, stated that “the provincial government is of the opinion that the financial input to the transportation picture in the Greater Vancouver area…should be on the basis of a 37,5% outright grant from the provincial government on a progress-payment basis to the transportation authority; 37,5% outright grant, again on a progress payment, cash payment basis by the federal government and 25% input from the regional district, again on a cash progress-payment basis”. The proposal leaves considerable uncertainty since it does not commit the provincial government directly to rapid transit, but only to “transportation” which could include anything and everything. Furthermore, it is conditional on grants from Ottawa and a heavy 25% percent load on the region. However it does acknowledge the need for aid by senior governments and does offer a basis for negotiations. In my view we should press for 100% of capital costs to be paid by senior governments, plus a share of the operating costs. The rapid transit study proposes a new retail tax, increases in property taxes and increases in gasoline taxes as ways and means to raise whatever money the GVRD must pay for rapid transit. I don’t think much of any of them because they all place the biggest burden on the people least able to pay, working people and low income groups that comprise 80% of the population. As an alternative, I would propose land assembly and assessment of big properties at their true market value. A profitable means of raising funds for rapid transit is through land assembly. When a rapid transit route –the Kingsway corridor, for example—is definitely agreed upon, the transit authority should acquire substantial sections of land along the route, especially in the vicinity of the transit stations. This land is bound to increase greatly in value due to new attractiveness added to it by the rapid transit corridor and the rezoning upwards that would be necessary. When the transit corridor is completed the Transit Authority could develop this land and sell it to private developers. Million of dollars in revenue could be raised in this way. The principle is a sound one. Since the new land value are created by public action, the benefit should accrue to the public and not all go to private real estate speculators and developers as has always been the case in the past. This method has been used in Britain for some time in connection with public housing projects. 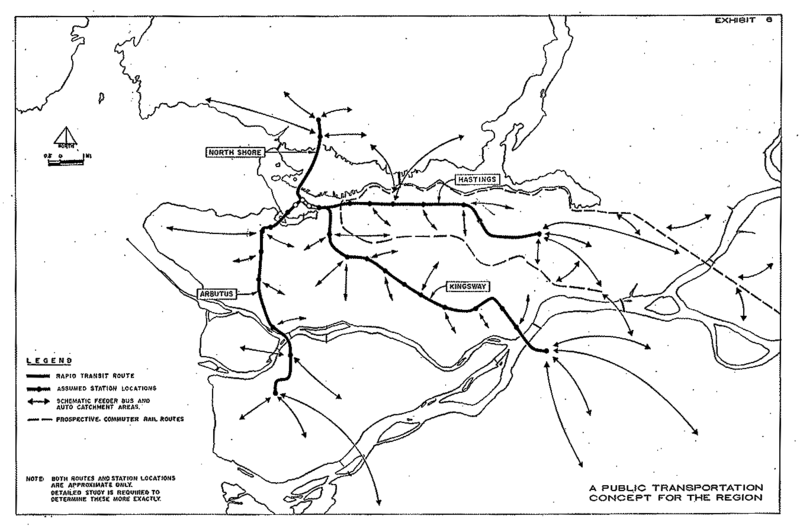 Interesting that we never hear mention of the rapid transit connection to the North shore. This would also make rail to Whistler viable again. I found it interesting at the end of the article the author proposes using land value increases caused by rapid transit projects to pay for those projects, something that Translink has recently returned to, but which wasn’t used for those initial lines. Personally, I don’t think a rapid transit connection to the north shore using a third crossing would be viable. The seabus connects reasonably well, and if operating costs were covered so they could run all three seabuses at the same time that would easily meet demand. A connection using light rail over an existing bridge, which would have to be the second narrows bridge, wouldn’t be a bad idea necessarily, though the demand in that area likely isn’t very strong right now, and who knows where it would go from there. Maybe following the highway to Lonsdale? That’s just speculation, though, and pretty unlikely. Thanks for the post, though. It’s very interesting and frankly ahead of its time. 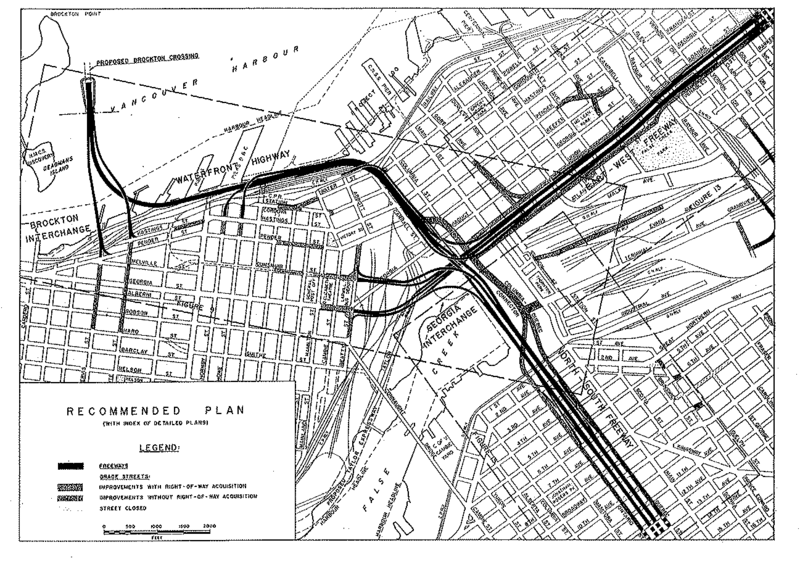 The connection to the north shore at this time was considered as a “secondary” use of a third crossing (Brockton crossing) part of the freeway plan. I guess the dropping of the freeway plan will have triggered the Seabus solution instead. Note that the idea to use the waterway is already in the pamphlet ( I have linked the pdf of it). Not only the map and the specs of the skytrain system was already formulated in the pamphlet, but the governance and financing aspect of it, was also addressed in term sounding quite actual. Freeways are great! I am so glad they are building the gateway project! Transit is simply not an option for those of us who must drive kids to school or after school activities. Transit is also not an option for those of us who work in construction, and need to take tools to work. I have also noticed that people who work night shifts have no choice but to drive because the skytrain closes down in the midle of the night for maintenance. Apparently due to the way it was designed there is no way the skytrain can operate 24/7 so this will always be a problem. I guess it is a bit off topic and provocative comment, but you raise eventually legitimate concerns. While it is understandable that some people, will still need to drive for reasons you give, more freeway is not necessarily the solution, but better allocation of existing road space, including use of it by some currently non-existing transit on Hw 1, should be considered first, and one way to do it is to apply free market principle on road resource: that means road pricing (see https://voony.wordpress.com/2009/09/18/translink-and-bridge-tolling/). Since you mention working in the construction, I guess you are at work well before 7am, and so like the night worker shift, you could escape significant congestion toll if not all under this scheme. Instead with the Gateway project, you, as well as the poor worker on night shift will have to pay the Port Mann bridge toll in full, this in addition of heavy tax (because toll will be far to be enough to finance the 4 billions gateway project, and the HST is probably not stranger to it). Also, have you questioned the sense of a society where you “must drive kids to school” and anywhere else ? does it sound sane to you? Building freeways to handle rush-hour traffic is silly, unless you want roads 10 lanes on each side, plus one new one every year), but building SOME freeways makes sense. In cities that have real freeway systems, you don’t get Safeway trucks trundling down your street at 3am (hmm… the moral to this: don’t live on or near Knight Street, 1st Avenue, 12th Avenue, Oak Street, or basically ANYWHERE) delivering groceries to be sold at branches. (You really can’t offload the groceries from the trucks onto the Skytrain, and then expect store employees to pick them up – no doubt, on bikes – and display them in the store). As bad, or worse, is the lack of left turn lanes on major streets in Vancouver – don’t you just LOVE it when the left lane all of a sudden STOPS because ONE wants to, just HAS to, turn at some street that DOESN’T have a turn lane? That, and the (how many kilometers is it?) distance on a two-lane undivided, NARROW street between the Grandview Interchange from #1 to UBC is ridiculous, as is the idea that “B-Line” buses – which, by the way, are stuck in non-separated automobile traffic – is really going to make a difference, except to the people who HAVE to ride the buses.